Here are some live and online courses you may find helpful. I am co-conducting a course called Play to Learn with Sharon Boller and in conjunction with ATD. You can read about and sign up for the course here. 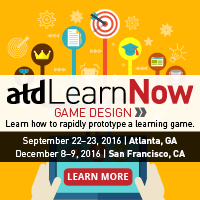 In this course, you’ll work in small groups to develop an actual learning game prototype that will be tested and refined during the event. You’ll leave with a design that you can put into production as soon as you return to the office and the knowledge to develop new, innovative games in the future. We will explore a variety of different game types and identify what makes them playable. Then, using a step-by-step approach, you will design your own learning game and play it. After attending this workshop you will leave with a coherent road map to help design future games (digital and/or table-top). You will also take away a list of resources to help further your learning and skill-development as a game designer. I’ve authored at Lynda.com a number of courses related to interactive instruction and helping you prepare to teach as well as providing some instruction on gamification. Each of these courses share some tips, techniques and hopefully a little wisdom I’ve gathered over the years as I’ve worked to teach students the art and craft of Instructional Design. Here is a course called Core Strategies for Teaching in Higher Ed which covers everything from time management for professors to integrating alumni into your course to balancing the service, teaching and research commitments. Here is a course to help you write successful grant applications for both higher education and in the K-12 setting. It’s called simply Grant Writing for Education. Here is a “nuts-and-bolts” course. A fundamental course about the writing of a syllabus. It is an often overlooked element in preparing to teach. Learn “How to Write a Syllabus” with this course. If you are thinking about being more adventurous in your teaching, think about gamifying some of your instruction. Start small and then add more and more game elements. It’s effective from a learning perspective and really engages students. If you are not sure where to start, check out “The Gamification of Learning.” It will help you think through the gamification process and to create meaningful gamified instruction. Here is a sneak peak.